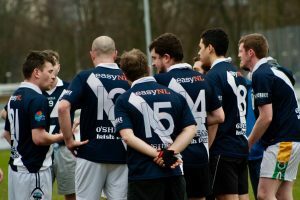 On Saturday 4th Of March the Shams travelled with a lightweight team to compete in the Annual Den Haag invitational. As our only pre-season tournament, it as a great opportunity to shake out the ring rust from 3 months without kicking football, and a chance to see how our rivals have progressed over the same period. Due to various unforeseen reasons, we only managed to travel with 7 Shams, along with 2 men hobbling the line. We needed to get some help from our rivals, luckily Den Haag, Leuven and Raheens were happy to help out on the day so we were well able to put up a good fight. 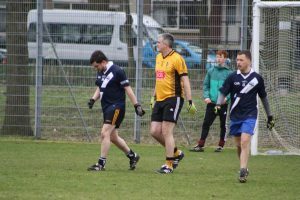 Our new look team included Eddie van der Sar in goals, a rejuvenated Ciarán ’Darren Fay’ O’Reilly at full back, Tijs ‘The Beast’ Beenhakker in nose bleed territory at half back, Alan Mullen and Donal Murphy lining up in the middle of the park and Ciarán ‘Beag’ Matthynssens and newcomer Kevin Murphy in the full forward line. Our Group consisted of Leuven, Den Haag and Donard the Glen of Wicklow and first kick off was 10 am. After a brief warm up and team talk we took to the field. We kicked off with a 2-3 to 1-6 draw with rivals Leuven, Beag Matthynssens was inspirational against his brothers’ team and we were very unlucky not to come away with the win. Donard the Glen proved a different kettle of fish, an awful first half performance was followed by some inspirational defense in the second which showed we really did have an off day and we are not just at these tournaments to make up numbers. 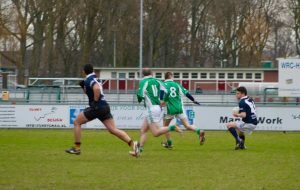 Finally, we came up against Den Haag, the old friends, who we hate to lose to, and showed what we are about as a team. The final score of 2-4 to 1-7 was the result of one of the most enjoyable matches of the day. Only for a heartbreaking miss in the last minute we could have taken the win! All things considered; two draws and some great performances throughout is a good result and we will go forward to the Benelux championship with a lot of confidence. The Holland Ladies had a much more successful day out. After coming out of a tough group they won a hard fought game against Belgium to move on to the Final. This was one of the best finals in my memory and, showing serious bravery our very own Rosie Young put herself at huge personal risk to score the winning goal for the ladies. 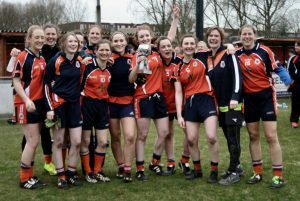 Congrats to Rosie (Team Captain), Anita, Janneke and Eileen on a great days football. Keep flying the Shams flags high girls! 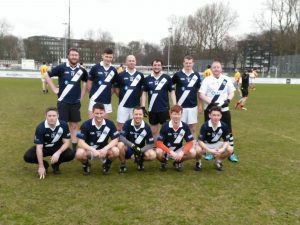 Thanks to Den Haag for a fantastic day out, all the players who helped us out to field a team, and of course all the Shamrocks who made the effort to go to Den Haag. 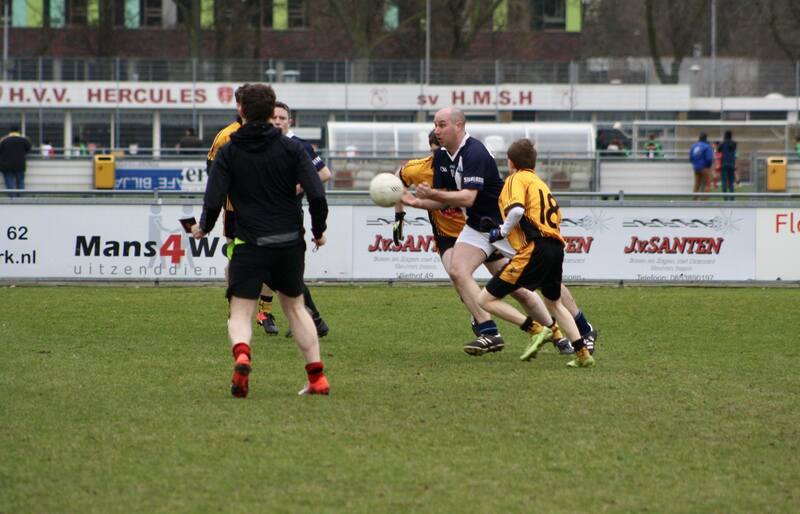 Our next tournament is back in Den Haag and will take place on Saturday the 8th of April. We are looking forward to seeing everyone there.